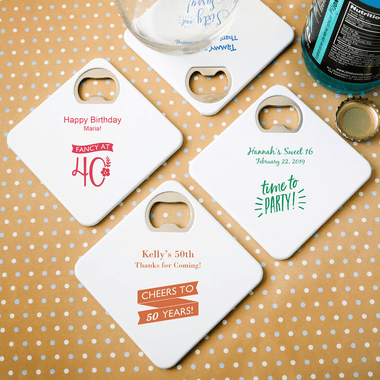 Two party favors in one, this bottle opener coaster makes the most perfect practical favor. The coasters are made from solid white plastic. Set into one corner of the coaster is a sturdy metal bottle opener. The black felt bottom makes for a non slide surface. Measuring 3 1/4 x 3 1/4 inches, use our designer to create your custom message. Very pleased all around with this item. I ordered these for our company birthday lunches-as favors for the guests. They are going over really well. Everyone loves them! They are lightweight, mulit-functional. The ordering was really easy and shipment was quick. Everything arrived as expected. Will def. order more from this site in the future.